BAUER POTTERY TRACY IRWIN LARGE PINK PUMPKIN ART BOWL! 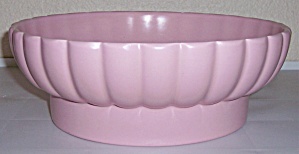 THIS IS AN OFFERING FOR A PRISTINE BAUER POTTERY MATTE PINK TRACY IRWIN DESIGNED PUMPKIN ART BOWL MEASURING 10-3/8" WIDE. MOLD MARKED BAUER. NOT A HINT OF USE AND HAS NO NICKS, CHIPS, CRACKS OR REPAIRS. SHIPPING FOR THIS FINE ADDITION TO YOUR COLLECTION IS $9.95.